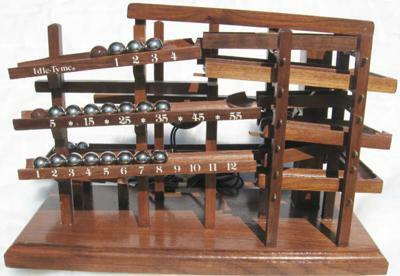 Here is the original Rolling Ball Clock. The Idle-Tyme Clock. When Harley Passed away in 1985 the family closed the business. It was far to hard emotionally to continue on. But Tyme heals all wounds and Joe, Harley's Son and primary clock maker is working on getting the business started again. Go to their web site for a complete history of the clock and it's inventor, as well as information on when the clocks will be available again. Finally I can own one!! Hi Joseph! I saw your Dad's clock design 30 years ago at Buena Vista Village (Orlando - Disney World) in one of their retail shops. So out of my budget then all I could do is go back a couple times and drool at how cool this timepiece was! When it sold I was heartbroken and on a quest to find another time piece to target ownership one day. Not too easy to find either back then! An unusual gifts store sold a plastic one that just didn't satisfy my desire for the wood one I first laid eyes on. I'm so happy to learn you have taken up the business and making them available! 30 years Joseph, and now I can have one- I am ecstatic! Thanks for realizing how your Dad's design was so loved and desired. wow...the real ball clock going to roll again?